Splash Dive Center offers sailing tour. Our Hobie cat tour with instructor is no experience required. We provide recreational sailing lessons and you have the advantage to learn and explore something new. Also, if you do not want to worry enough just sit back and relax and our guide will take you around the surrounding Ngerkebesang Island. Kayak Rentals featuring sit-on-top kayaks. The Splash Pro Shop has for sale a full range of scuba and snorkeling equipment as well as many other essentials and accessories . . .We are authorized dealer of TUSA and Scubapro products. We order directly from the Manufacturer / Distributor of the items to provide you THE best quality equipment. 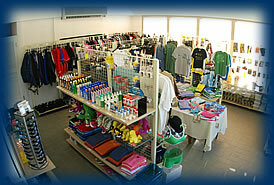 We carry a full range of diving and snorkeling items. At Splash we have our own range of fashionable resort clothing too: from souvenirs Splash Logo t-shirts, shorts, hats and more. The Splash Pro Shop has what you need.